If number is not correct inform us. 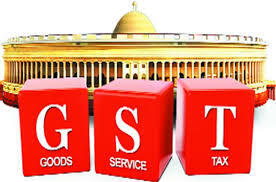 Do you have any problem in GST in Panchkula,Derabassi & Zirakpur. Are you facing issue in Account Invoicing ? Do you need GST number ? 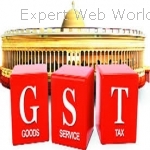 Have You faced any problem with Goods and Services TAX Offline Tools during installation ? Door step solutions in Panchkula in very nominal charges. Goods and service Tax (GST) replaced Sale tax, Service Tax, Entry Tax, Excise and many indirect taxes and implemented from 01 July 2017. Government of India gives some relaxation to small Dealer and manufacturer in GST. Dealers / Manufacturer having turnover up to 20 Lakh in a year not required o register under GST. A new concept RCM (Reverse Charges Mechanism) is introduced under GST. However it is not new concept for service providers, because RCM is already applicable of certain type of services in Service tax. But Dealers/Manufacturer whom are dealing in goods, it is a new concept. It is first time when goods are also covered under RCM. In this concept every purchase from unregister dealer covered under RCM. Government gives relaxation for small purchases up to rs 5000/- . In other words we can say dealer have not required to pay GST under RCM up to Rs 5000/-. Registration limit of rs 2000000/- and 7500000/- is not applicable to Reverse charges, hence we can say every dealer who is liable to pay RCM required to register under GST. No threshold hold limit applicable for the same. 1. Unregister Dealers / Manufacturer :- Unregister Dealers/Manufacturer are not required to file any return under GST. Register under Composite Scheme: - Dealers/Manufacturer register under composite scheme are required to file quarterly and annual return. They have to use GSTR-4 to file quarterly return and for file annual return by using GSTR-9. Details of inward supplies of taxable goods and/or services effected claiming input tax credit. Monthly return on the basis of finalization of details of outward supplies and inward supplies along with the payment of amount of tax. CGST, SGST and IGST are main components under GST regime. 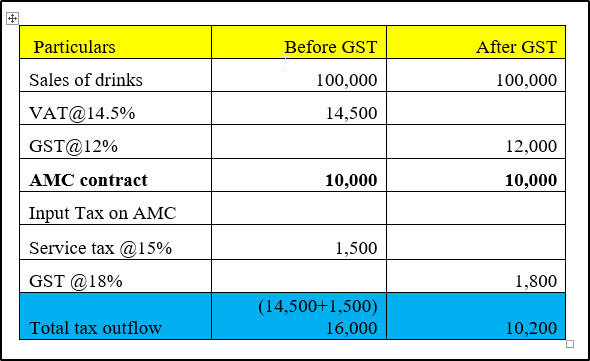 When any business raise a invoice(register under normal scheme) have to charge IGST or CGST and SGST.When a dealer make interstate sale the he has to charge IGST in his invoice and at the time of making intra state sale has to charged CGST and SGST rate of CGST and SGST is depend on GST rates. For example if GST rate is 18% then as dealer rising invoice for interstate sale he has to charged IGST @ 18% and at the time of intrastate sale then he charged CGST 95 and SGST 9%. In case of dealer location is in union territory the he has to mention UTGST in place of SGST. Under the old tax regime, the sale of packaged software attracts both VAT and Service tax. VAT rate is around 5% in most states and service tax rate is 15%. Excise duty is also applicable in the case of manufacturing of IT products. Example: If a software comes on a DVD, CD or hard disk, then there are 3 taxes that apply to it. Service tax for providing service as software can be downloadable for multiple times. All such complications and double taxation will be removed under GST. GST on IT sector will attract 18% on software services provided by software companies. For purely software services, the cost of such services will increase under GST. GST rates for exports services are zero-rated and input taxes paid will be allowed as a refund. The default rule for place of supply (export of service) is the location of the service recipient if the address of the recipient is available. So, exporters must ensure that the address of service recipient can be presented before the authorities on request. GST rate for services has increased to 18%, IT industry will definitely benefit from GST. Example : - Mohit sale for the month worth Rs. 1,00,000. He also has to pay an AMC of Rs. 10,000 per month on the computers used in his offices. To sell the goods to the consumers on behalf of the company. In this case companies relax with burden of additional investment for their own offices in each or varied states or territories, and appoint C & F agents to cater their business at fixed remuneration (% on sale). Other reason was to take benefit of CST on interstate sale by issuing form C, under law. After introduction of GST, CST factor is gone away and companies appointed C & F agents for this factor alone are certainly effected. But most of big industrial houses appoint C & F agents with economy and growth in mind and it will not effect the business of such trade houses. C & f agents have to take separate GST no. for their each different state Warehouse . In this case every, state warehouse have required different GSTN and to submit different GST return. It increases the burden of compliances on C & F’s. Benefit of this is no. of warehouse decline due to GST imposed and fixed rental cost also reduced. Tax rate of all state will be same and Stock transfer will also taxable after implementation of GST. The house property should not be used for the purpose of business or profession carried on by taxpayer . Rental income of vacant plot (not appurtenant to building) is not chargeable under this act but taxable under the head “PGBP” of “IOS” as case may be. For Example:- Land given to any office in rent for parking (owner of office is other person and land has not any construction) is chargeable to tax under IOS & PGBP as case may be. Income is taxable under this section only in the hand of owner, owner can be a legal owner or deemed owner. Definition of deemed owner given in section 27. If owner of house property used his property in his business as a Factory, Warehouse, Parking area and for any other purpose can not be taxable under this head. Farm house is not chargeable under this act, in other word we can say income from farm house is not taxable or exempt. Owner ship of house property lying with Municipality. House property of Political Parties. Any House property related to Charitable trust & Religious body. Standard deduction is 30% of NAV, no other expenses are allowed under this head related to repair of building. Deduction of interest paid during the financial year is deductible from NAV. Total deduction for self occupied house capped at Rs. 2 lakh. Gross annual value is higher of Expected rent and actual rent of property. In case of property is Vacant in FY for some period, then deduction is allowed to calculate the GAV. don't forget to mention that you found this ad on Expert Web World Directory Website. Thanks for filling our gst return on time and you have very low price than other. realy professional work. we recommend to others friends . Please login to your member account to post reviews.